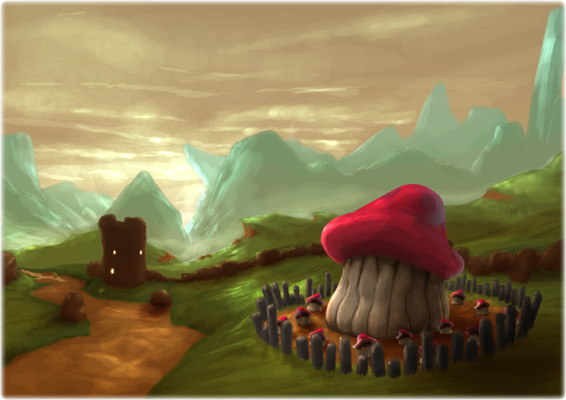 What started out as just another mushroom in the Fantasy Hero Institute garden has now become a massive mushroom thanks to the tender care of one of the groundskeepers. Thanks to the magic of an unknown prankster, it has now become the formidable "mushroom man". Resembling neither plant or human, this creation is best described as an "it". However this "it" has a very unique ability that cannot be found anywhere else. Everything it touches turns into a mushroom! Under the stress of its unimaginable sadness, it has started to wreak havoc on the Fantasy Hero Institute turning everything in sight into mushrooms. Fortunately the same person responsible for growing it into the massive form was also able to encourage it to use its special skill in a more positive way? Under the tender coaxing of the groundskeeper, it now volunteers its "protective" services to anyone bold enough to summon them!